The No. 9 Harvard men’s water polo team was among the West and East Coast teams to descend on Princeton, N.J., over the weekend to participate in this year’s Princeton Invitational. In a melee that featured 15 squads from across the nation—including seven top-20 teams—No. 18 George Washington, Navy and Fordham filled the itinerary for the Crimson. Among the other competitors were the 2017 National Champions, the No. 2 UCLA, and No. 4 Stanford, No. 13 Princeton, No. 16 Cal Baptist, No. 17 Brown, Air Force, Iona, Johns Hopkins, Santa Clara, St. Francis Brooklyn and Wagner also split time in the Denunzio Pool at Princeton University. "This season has been successful so far," junior co-captain utility Austin Sechrest said. "On the first weekend of the year, we took down the No. 7 team in the country, UC Davis, and then we won another rivalry game this past weekend against George Washington to push our record to 5-2. Dennis Blyashov, a third-team All-American as a freshman last year, has been playing really well so far, as has our center Charlie Owens. We have three really good goalies who are all competing hard to earn playing time." The news of a Harvard top-ten ranking was released a few days prior to the Princeton Invitational in the College Water Polo Association’s announcement of the top 20 teams on Sept. 5. The number nine ranking ties the Crimson’s highest in program history. Only two other times has Harvard ventured into the top 10 in national standings. The first followed the team’s 2016 NCAA appearance, and the second came in the preseason rankings entering the following season. Returning to Cambridge with a perfect record over the trio of this weekend’s matches, there is little chance of the team dropping in the CWPA’s new rankings. In the final matchup of the weekend, the Crimson (5-2) squared off with a competitive Rams (2-4) team. The first quarter of play featured even play that ended in a 3-3 draw. Freshman attacker Alex Tsotadze broke that tie with a goal that ushered in offensive momentum: strikes by Sechrest, sophomore attacker Dennis Blyashov, and senior attacker Nick Bunn followed Tsotadze’s own. The offensive onslaught pushed Harvard into the halftime lead, but the second half allowed the squad to grow that lead. Sechrest nailed a shot and Fordham returned the favor, but the momentum had already swung the Crimson’s way. By the end of the third quarter, the Crimson had grown its one-point lead to five at 11-6. The final quarter nearly mirrored the third for the Crimson’s offense, as the team converted four shots—from Sechrest, Bunn, Tsotadze and freshman 2-meter Michael De Mundo. The Rams finally got in a grove as well, growing its score to 10, with the final point coming in the last second of play. Junior goalie Nikhil Suri held firm overall, though, saving 11 goals, good for a season high. With the win, Harvard continues its ten-game win streak against Fordham. A matchup with the Midshipmen (3-3) kicked off the double-header on Sunday for the Crimson. In the morning contest, Harvard wasted no time getting started, striking swiftly with two goals from Blyashov within two minutes of the opening horn. Sechrest followed in suit, adding another tally to the Crimson’s point total before Navy finally answered. Midshipmen junior attacker Kevin Volkov nailed two goals before Ondracek sealed the first period of play, sending his Crimson into the break with a 4-2 lead. By the start of the third, the Crimson was up three. A five-point third quarter, including junior attacker Charlie Owens’ first point of the match, expanded Harvard’s lead to 13-8 heading into the final frame. Navy scored once more in the fourth while the Crimson nabbed two, propelling Harvard to its third consecutive victory against the Midshipmen. After the first set of play, the Crimson built upon its two point lead by outpacing Navy in the second quarter, four goals to three. Blyashov, Ondracek, sophomore attacker Bruno Snow and junior co-captain defender Bennie Seybold combined for the second quarter effort, and Harvard returned to the locker room on top, 8-5. In its first matchup of the weekend, the Crimson faced its toughest opponent of the two-day invitational. In the 12-11 back-and-forth tale with the Colonials (6-1), Harvard started freshman Noah Hodge in net. The first-year amassed a career-best 12 saves which, complemented by a season-high goal performance by Sechrest, helped to earn the Crimson the victory. "We came out against GW a little bit lethargic, and we knew we needed to answer back after a poor first quarter," Sechrest said. "I think it really started on the defensive end and we were able to turn some stops into goals going the other way in the second quarter. Our freshman goalie Noah Hodge made some big blocks and helped to feed our attack." Overall, Sechrest proved to be the offensive catalyst with a season-best five goals. Scoring early in the second quarter when Harvard faced a 4-2 deficit, Sechrest’s tally was replicated by Ondracek, Owens and Blyashov. By the time the first half ended, the Crimson had completely erased George Washington’s lead and tied the match at six apiece. In the second half of play, a back and forth spurt was broken by Sechrest’s third goal of the game, ending the third quarter at 9-8. The back and forth picked up again in the fourth before Sechrest netted his fifth goal of the game to win with only 39 seconds remaining. —Staff writer Cade Palmer can be reached at cade.palmer@thecrimson.com. Following losses to nationally-ranked opponents Bucknell and Stanford, Harvard recorded its first win of 2015 on Sunday. 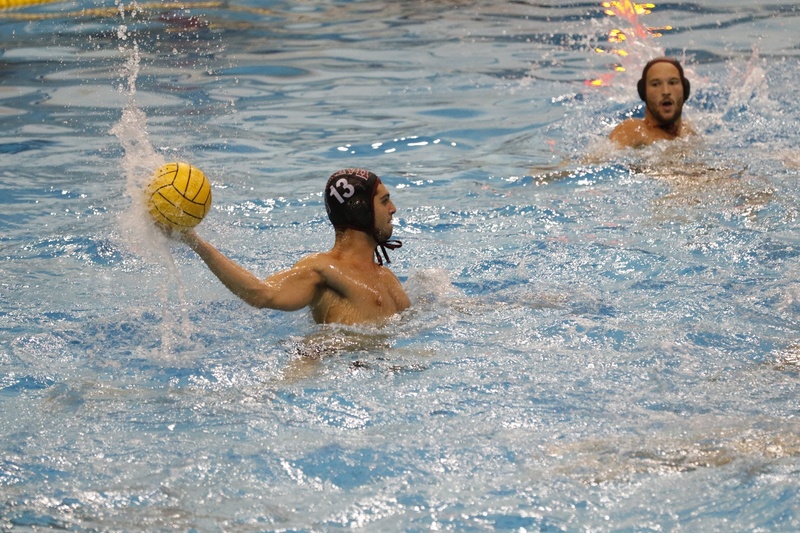 The Harvard men’s water polo team extended a streak and snapped another before finishing second at the Ivy League Championships this weekend. After winning all five games at the Santa Clara Bronco Invite last weekend, the Crimson recorded two victories on Saturday and one on Sunday at home to improve its winning streak to eight. Up against three ranked opponents this weekend, the Crimson came up with big wins, including its first ever victory over Indiana.